Is ROES compatible with Windows 8? 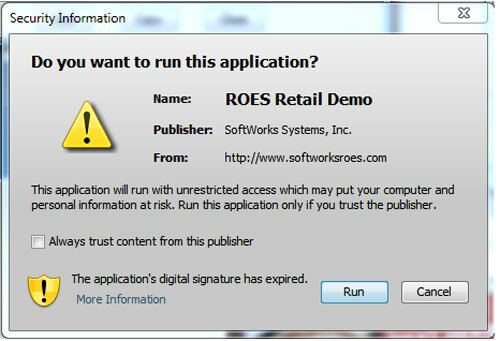 When ROES launches I am presented with a security dialog asking: Do you want to run this application? Is it safe? Can I use tiff images with the ROES Client, or just jpeg’s? What if I want to Combine the Shipping of Multiple Orders? You should have a minimum 1.6GHz, late-model processor with 2GB RAM and either Java 1.6 or 1.7, the latest Java is available here. Apple Java is native to OS X 10.6 and earlier. Apple OS X 10.5 or higher, and all Microsft-supported 32/64 bit versions of Windows (64 bit Windows 7 recommended) will support the application. Be sure to maintain enough free drive space to build, save, and retain order files. Windows XP, nearly 11 years old now, is supported but only a 32 bit operating system, so can run into memory issues with larger orders. 1) Desktop Icons Appear White – this appears to be a Java rights issue and is resolved with an upcoming Java release, Java 7 update 12. 2) Unable to transmit orders – This was seen with FTP and Kaspersky Internet Security 2013. Removing Java 7 and installing Java 6 update 37 64 bit instead (available from here, use the Windows x64 link) allowed the send to occur. 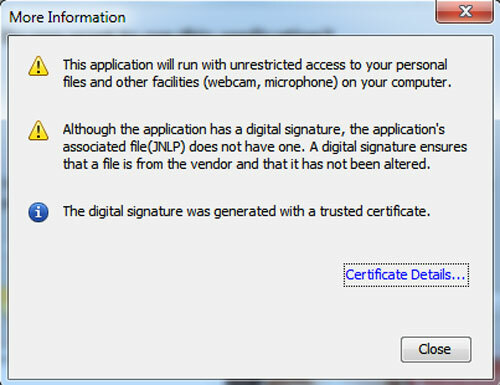 Nowhere is an expired certificate listed or indicated, just that the JNLP file is unsigned, which is not unusual for a Java application. The ROES program is securely signed with a valid certificate that expires in 2014. Both JPEGs and TIFFs are accepted for upload inside of ROES. If you experience problems while uploading a 16 bit TIFF or other file type, please feel free to upload your image us via our direct upload form. If you place multiple orders for different items that are being sent to the same location, we can combine the shipping in most situations. Simply place your orders as you normally would and select the same shipping option for each order. For each order, you will need to indicate that you would like to have the orders combined. This can be done by selecting the “Print Order Comments/Notes” check box when reviewing the items in your cart just before checkout, on the right side under “Options”. Once the orders have been received and processed, we will simply provide you a refund for difference of the shipping paid, only charging you for the shipping amount that is greatest among all of the orders and refunding the rest. Orders for items within the following catalogs CAN NOT be combined: Press Print Products, Metal Print Products.